Hold: 5 – strong hold. Try Tecni.ART Web, texturising wax-paste for a deconstructed, dishevelled style. Unlimited re-styling for structured, tousled and textured looks. Apply to dry hair by rub a nut-sized amount between your hands and pull your hands slightly apart to stretch out the fibres, just like a web. Run through your hair for a textured effect and style as desired. 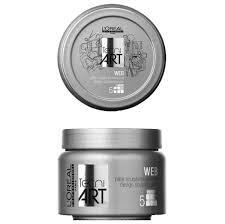 Buy L’oreal Professionnel Tecni.ART Web 150ml on-line today at Riah Hair.